Can Management personnel recognize the monetary benefit of TOGAF? What are the rough order estimates on cost savings/opportunities that TOGAF brings? Are there any easy-to-implement alternatives to TOGAF? Sometimes other solutions are available that do not require the cost implications of a full-blown project? What problems are you facing and how do you consider TOGAF will circumvent those obstacles? To what extent does management recognize TOGAF as a tool to increase the results? This book is for managers, advisors, consultants, specialists, professionals and anyone interested in TOGAF assessment. Featuring 371 new and updated case-based questions, organized into seven core areas of process design, this Self-Assessment will help you identify areas in which TOGAF improvements can be made. Using a Self-Assessment tool known as the TOGAF Index, you will develop a clear picture of which TOGAF areas need attention. 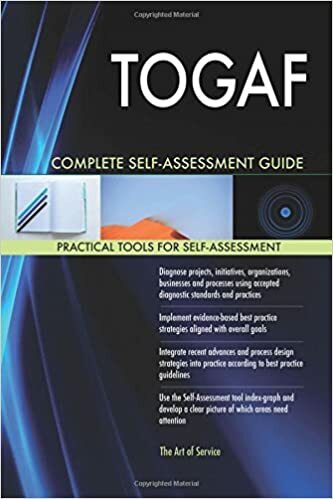 Included with your purchase of the book is the TOGAF Self-Assessment downloadable resource, containing all questions and Self-Assessment areas of this book. This enables ease of (re-)use and enables you to import the questions in your preferred management tool. Access instructions can be found in the book.